This past fall the Harker InvenTeam group earned a $9,110 grant which has now led to further research and development on an aquatic thermoelectric generator. The already twice-showcased device could go on to become a common sight, floating around backyard swimming pools. The InvenTeam is run by the Lemelson-MIT Program and awards grants to teams of inventive high school students with the goal of turning their visions into reality. The Harker team developed a solar generator that uses swimming pools, or other bodies of water, as a potential new alternative and cheaper source of green electricity. Designed to power schools, homes and businesses, the device utilizes the power of thermoelectric panels capable of harnessing the temperature difference between a hot surface and cold water. Potentially, huge floating generators might someday create enough electricity to move beyond neighborhood swimming pools and help power entire coastal regions. The groundbreaking generator was designed by Prag Batra, grade 12, and his team: Sachin Jain and Jay Reddy, both grade 12; Ramakrishnan Menon, Wilbur Yang and Shantanu Joshi, all grade 11; and grade 10 students Nikhil Dilip and Pranav Batra. Anthony Silk, upper school math teacher and the team’s advisor, explained that as this device floats on water, reflector panels focus sunlight onto a black surface converting the solar energy to heat. The heat is then passed through thermoelectric panels and passively dissipated into the surrounding water. A few weeks ago, Harker and the Lemelson-MIT Program jointly sponsored a special evening presentation of the InvenTeam’s project. Held at the Nichols Hall auditorium, the event was attended by Harker families, administrators and board members. Following the InvenTeam’s presentation, special guest Joshua Schuler, executive director of the Lemelson-MIT Program, spoke on the importance of creating an ecosystem for young inventors in Northern California. Most recently, the students represented one of 14 student teams participating in the Open Minds exhibition run by the National Collegiate Inventors and Innovators Alliance at the Exploratorium museum in San Francisco. They had received an invitation to do so from the NCIIA and Lemelson-MIT Program. “I found the Open Minds event to be amazing. 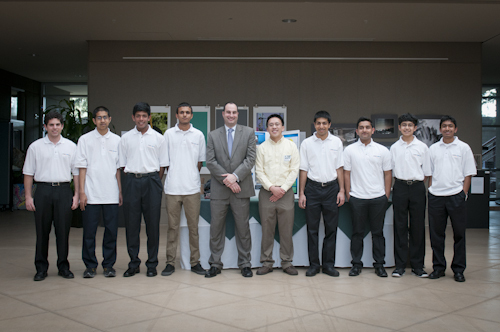 Our Harker students got to showcase their invention alongside some of the top college teams in the country,” said Silk. “They spent the evening answering tough questions from scientists, inventors and investors who all seemed extremely enthusiastic by the work done so far. It was also great preparation for EurekaFest, which will happen this summer at MIT, where the students will be presenting their project along with the other 15 high school teams from around the country,” he added, noting that a finished product should be ready by the time of the EurekaFest in June. The team is being sponsored by Lenyard Food Service for the trip to EurekaFest. Upon receiving the initial grant award, Batra said possible applications for the generator were numerous. “For instance, the device could be used on almost any body of water and could be incorporated into future boats to provide renewable, portable power at sea,” he had said, noting that in the process, the device would help reduce reliance on nonrenewable energy sources such as fossil fuels and provide clean energy without negative environmental impacts such as air or water pollution. Now, with the developing project generating so much early interest and excitement, it appears that Batra and his team have created a potentially marketable product!